Come join Fremont-Winema Forest archaeologists as we surface survey, test excavate, and conduct analyses of one of the largest (alomst three (3)-acres full!) can and refuse dump sites in the region. 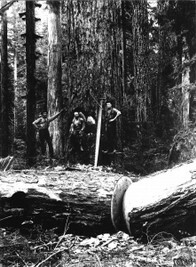 The site was amassed over the period from 1938-1941 as the main refuse disposal area for the Pelican Bay Logging Camp, which was used as a base for railroad logging operations for extraction of timber from the Sykan Unit of the former Klamath Indian Reservation. There is an estimated 5000-plus artifacts of sparse metal, associated with thousands of food cans, further associated with thousands of meals, all uninventoried. We are going to try and understand logging camp culture from the garbage that they left behind, locally referred to as "God's Dump." We hope to see you this summer!